There’s so much to take into account when picking where to go for your honeymoon- from the time of year, to whether you want to travel right after your wedding or not, to how long to go for, budget, etc etc. And of course, your honeymoon should be special; why go to the same place that your friends have been? This is your chance to have a once in a lifetime trip, to go all out with your special someone. You’ve traveled together before, and you’ll surely travel together again, but nothing will ever compare to your honeymoon. Shete Boka National Park, with Curaçao’s highest peak, limestone bluffs, walking trails and small inlets with breeding turtles- you definitely won’t be bored in Curaçao. When to go: One of the best parts of a visit to Curaçao is that it’s outside of the Hurricane belt. May to November it’s off season so less busy. December to April is great, too, but it’s peak season so you’ll have to share paradise with more people. Where to stay: Baoase Luxury Resort is a small (23 rooms) boutique resort with elegant, Balinese inspired decor. Rooms start at $550/ night. Though it’s an intense trek to get to for travelers from the US, it’s well worth it. Tasmania is Australia’s only island state (about the size of West Virginia) with a population of just over 500,000 people. Here you can explore bright purple lavender fields, hike the most interesting and varied of landscapes, explore thermal hot springs and caves, go on a wondrous roadtrip and wander around quaint towns that feel nearly deserted. The island is also quite the foodie destination, with delicious and famous apples, seafood, cheese, bread, honey, nuts, stone fruit, craft beer, whisky, gin and cool-climate wines. And of course, it’s the only place on earth where the Tasmanian Devil lives, now an endangered species. When to go: December through February see the best weather (summer), and in Tasmania you never really have to worry about crowds. March, April and May are great for is leaves changing colors and rainforest exploring; though the weather does change on a dime so make sure to layer. Where to stay: Pumphouse Point is a boutique wilderness retreat, perfect as a base for your honeymoon adventures. Rates usually start at around $220/ night, depending on the room you choose. When to go: A fully tropical climate, there isn’t necessarily a bad time to go to Vanuatu. April to October is ideal. November to March is technically wet season, but that usually just means a short and fast burst of a passing intense rain, not all-day rainy days. Enigmatic Sri Lanka is a tiny island nation in south Asia; with its fantastic beaches, natural wonders, centuries old ruins, majestic temples, wildlife, and thrilling adventures, Sri Lanka is one of our favorite honeymoon spots. It’s easy for English-speaking travelers to visit, as the locals not only speak impeccable English, they’re also incredibly friendly and kind. There are all kinds of beaches on the island- from the glamorous, to the secluded, and even some to learn to surf at. Want to hang out with elephants, leopards, wild water buffaloes, civets, monkeys, bears, feral, fishing cats, snakes, crocodiles, lizards? It’s all possible in Sri Lanka. The inland tea plantations and hikes make for some of the most verdant green, stunning vistas we’ve ever laid our eyes on. When to go: Strangely, Sri Lanka is affected by two different monsoon seasons, which strike different parts of the island at different times. Though it sounds complicated, this also means that it’s always a good time to visit the island, you just have to alter where it is that you go in Sri Lanka depending on when you travel. When you think of Japan, you probably don’t imagine a semi-tropical, coral-fringed islands. 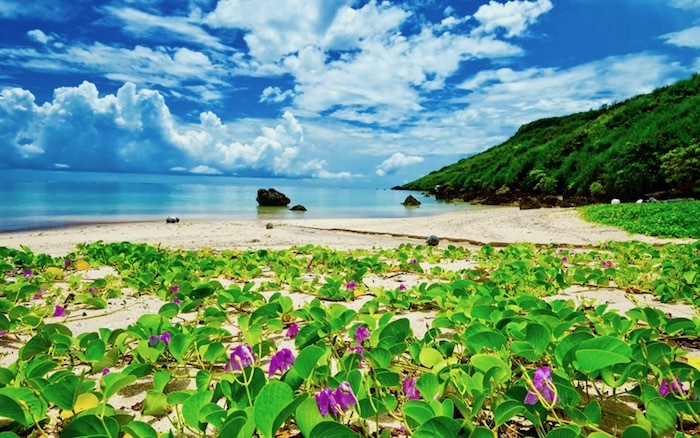 Actually, Okinawa and the surrounding south islands of Japan look and feel more like Hawaii and Southeast Asia than cosmopolitan mainland Japan. A nature-lovers paradise, here you’ll find lush primeval forests, tiny white sand beaches fringed by crystal clear waters, coral reefs, subtropical jungles and mangrove swamps. There are also plenty of markets, castle ruins, temples and history to get your culture fix as well. The food in Okinawa is a real treat- with influences from all over Asia, its bold and intriguing flavors are easy to fall in love with. When to go: The best time to visit is in roughly March to early May and late September to December. The rainy season lasts from early May to early June, while typhoons can be a problem in July and August, and occasionally into October. Where to stay: Stay away from large, international resorts and instead opt for the local and more interesting Hoshinoya on secluded Taketomi Island. Rates are generally about $400/ night. Our current favorite spot in Europe that doesn’t get nearly as much traffic as its neighbors, Portugal has a little bit of everything- stunning beaches (that you sometimes even have to rappel down to), amazing hikes, colorful, storybook like history, charming cities and the most interesting food scene in all of Europe. Take a road trip down to the Algarve coast, be sure to check out Comporta and Sintra, set aside a few days to really get to know Lisbon and of course don’t leave out spectacular Porto. Where to stay: Airbnbs and home/ villa rentals are the way to go in Portugal. For example check out Design Villa Abaton, for $218 a night. If a safari in Africa isn’t on your bucketlist yet, it should be, and the absolute best place to safari in Africa is Botswana. Hands down. The country has masterfully kept mass tourism at bay, and it remains a small country where you can most luxuriously and intimately witness wildlife and unadulterated, un-touristed nature. You’ll hear lions roaring and see elephans roaming free and happy. The lodges here are remote and stunning, and range from contemporary to rustic, but are always high luxury. It’s not a honeymoon that fits every budget, but if you can swing it, it’s definitely one to remember. You can easily pair a Botswana safari honeymoon with a visit to the stunning Bazaruto island, or Zanzibar or even the Seychelles, all just a short flight away. When to go: May through September is best, April and October are also generally good times of the year to visit. Sometimes referred to as a mini continent, this is an island in Europe that’s technically a part of France but feels like a world apart. Though the island is certainly not a stranger to visitors and tourists, it has somehow managed to keep its flavor and not turn into Europe’s version of Cancun. A honeymoon here is easy to fill with a little bit of everything- fabulous beaches, dense forests, sawtooth peaks, glitzy and sophisticated seaside towns, tiny fishing villages. You can also easily combine a visit here with Italy, France, Malta or nearby Sardinia. When to go: Like much of southern Europe, summer is warm but not ideal because it’s packed. Instead, we recommend Corsica honeymooners to travel April and May or September and October. Where to stay: U Capu Biancu is a real beachside haven with an amazing staff and the best views on the island. Rooms start at $350/ night.